If I knew then what I know now… I’d say this .. The first time I saw agility I was intrigued. The first time Brody ran through a tunnel I was HOOKED. Brody and I started doing street agility. If there was a place he could balance and walk along an edge he did it. If there was something he could hop over we were thrilled. I am always a little bit sad when I hash things up and can’t save a run but by the time I hit the finish line I’m over it. Trials aren’t stressful to me – they are FUN. They are places of great joy and I love to play! Does that mean I have no nerves? No, of course I get butterflies sometimes, but it’s not that sick feeling people describe to me; it’s a thrill of anticipation. I wish I could infect more people with the JOY that agility is for me. It is a stress reliever. It is a pleasure. It can be a triumph and it can be very emotional. I’m not generally much about crying except in the privacy of my car but three times now runs have brought me to the brink of tears of wonder. The generosity of our canine friends never ceases to amaze me. Being allowed to do something that is so FUN is a privilege and I’m one lucky person! Yes, the perfect (whatever – you fill in the blank) matters, agility is the most fun when a run leaves you feeling so connected it’s like your souls are intertwined. That’s tough if bars are falling and dogs are doing spectacular things that you didn’t ask them to do. 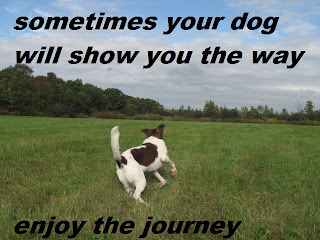 But the journey should be fun too. Not just the great clean runs but the time spent playing with your dog: teaching them tricks that aren’t just to build hind end awareness but tricks because you and the dog think they are cool; swimming, walking, lying on the couch, or floor, or bed. All the time spent just enjoying each other build a bond of joy – and that gives a place to reach when things are challenging. Say for example there is one of THOSE weave entries – one that’s tough to deliver the dog to on side and I’m running Brody. I walk the course thinking “gah, geesh, another reason I am not a dog trainer – I really wish somebody had explained why two sided weaves were so important BEFORE Brody got so patterned, and I can’t believe I couldn’t fix this easily when I tried to rebuild the weaves, and man this is going to be hard … and” on and on I can go. Then I look into Brody’s eyes .. we do our warm up dance and suddenly I don’t mind if my job is just a little harder than somebody else. Running Brody makes me happy. Every single run I’ve had with him I’ve been grateful for. Doing it right matters no matter if you are playing lawn agility or playing at Nationals. But if you aren’t playing with fun you might want to rethink your plan. I see people struggling with this concept most with successive dogs. Dog one sometimes gets a bit of a free pass as people work through the intricacies of agility. But then, with human nature being what it it, people think they get it. They know it. They are experts. Dog Two should a) do better than first dog b) learn faster c) be easier to teach. And the fun is gone. The stress of expectations is overwhelming sometimes for the dog, sometimes for the people, and most tragically, sometimes for both. The reality is most of us aren’t going to run at worlds (finances, time, skills – lots of reasons it’s out of reach for many) and we may not be able to fund beautiful indoor rings to train year round. Heck many of us will probably have to do what I did and have to take substantial periods of time off agility for one reason or another. If agility is fun the thought of agility can sustain you through the dry spells – my dry spell was actually when I learned the jargon to go along with my passion! Sitting beside hospital bed after hospital bed reading about agility and designing courses on scraps of paper was a little of escapism and whole lot of fun. Every dog is different, honestly if I didn’t think people should be treated positively too there are some people I’d like to shake. Your first dog may be a treasure or a challenge but your second, and successive dogs will fill their own role in your life. Thea is my play dog, we run only for fun and she has a completely free pass on expectations. Lucky us! Running Sally astounds me. I am so “not worthy” of this wondrous dog. Yup, I’ve wrecked her. Her contacts, as any regular reader of this blog know, frustrate me at times. But the failure in communication is my fault, if ones thinks in terms of fault, not hers. I view it as a learning experience not a failure and diligently continue to play with her. Who could resist a Sally? I love playing with Sally. a false start, more of our playing then usual is here too. All fun! Connecting with a dog while playing agility is magical. I wonder if people who get so hung up on agility forget that the rush is even better when agility is fun, and collaborative, and a journey? If I got a redo I would say this more clearly and more often. Agility is FUN. It is expensive, it can be frustrating, it can be heart breaking but it is FUN. If the fun is leaving your game stop, regroup and find the inner joy. Without that what’s the point? One of the biggest compliments I have been paid in agility is many people have commented that they enjoy watching my dogs because they have fun. We all have fun – and I wouldn’t want it any other way! Agreed. I try to keep perspective as well. I enjoy trialing so much as well. Just hanging out with friends, getting away from the house and the to do list. Showing off my dogs. And of course, any success is appreciated. I like earning the titles, but try to remember that when it is all over, no one really cares that one of my dogs earned an agility championship or didn't. Its all about the journey. Absolutely! Having fun should be our #1 goal! 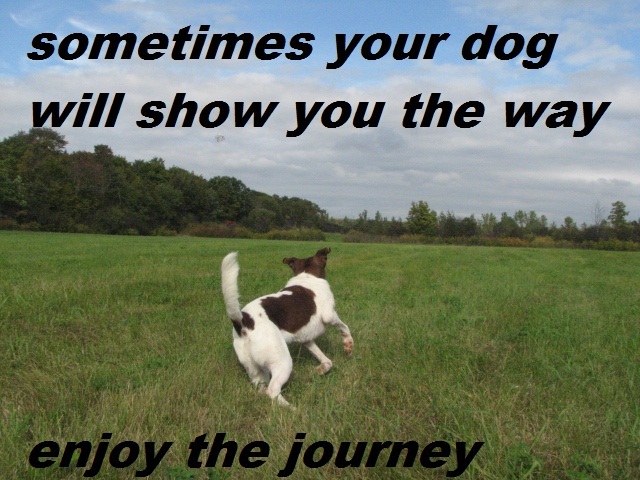 I completely agree and I have personally had a hard time with it with–yes, my 4th agility dog!–but it makes my day when someone says to me, "your dog looks like she's having a blast out there." Because I might be able to fool myself, but not all the other dog lovers out there watching. So well written! I was nodding my head in agreement the whole way through. btw, I couldn't get the video to play — music issue I think. really fantastic post-I always woder with the expense, the time invoved the risk of injury, blah, blah blah,why people who do not seem to have fun do it hahahaha, life is far too short to not have fun doing our HOBBY. ;-), your post made me smile!!! thanks everybody – this was a tough topic as there were just so many things to say!